Are you getting all the reports and info you need? How does a property and casualty insurance executive receive a continuous analysis of aggregated sales delivery and insurance policy renewal across sales personnel and organizations? How does this executive receive customized dashboards, focusing on precisely their functional area, refreshed daily or even intra-day, and incorporating data from core systems and external sources such as Government data, telematics data, and Salesforce.com? Can current sales reports combine and analyze injury rates per industry and the effect of weather events? How can the Senior Claims Executive see a 360-degree view incorporating diverse data such as weather, BLS statistics, telematics, and the built-in claims reports from core systems? 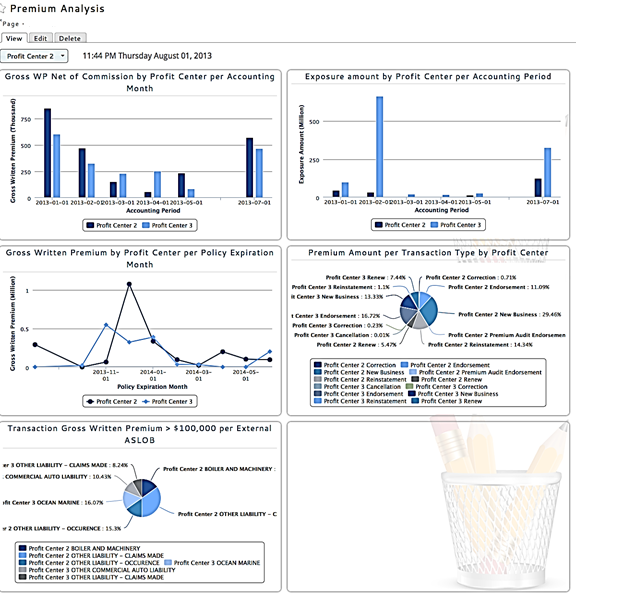 Return on Efficiency advantages its over 75 cumulative years of insurance systems experience answering these questions via our content rich self-service P&C Insurance Executive Dashboard and BI Analysis tool. Delivered over the cloud or behind your firewall, it is fast-start, and cost-effective BI and Analytics for Tier 2 and 3 P&C carriers, with the same depth and quality as the expensive and time-consuming systems Tier 1 firms can afford. Interfaced with Outlook, it integrates the dashboard itself with robust internal social communications, tasks assignment, and tracking to make this tool more than another piece of static display technology. Incorporating consistent and timely analytic themes, it becomes an integral part of daily operations, across the Enterprise or within a Business Unit. Data automatically aggregates from your data warehouse, core databases, Excel spreadsheets, Salesforce reports, and Chatter, integrating into this quick to implement and attractively priced insurance BI tool. Since all relevant parties see the same data, decisions are made from a standard set of analytics and timely data. Updating and version control of multiple Excel spreadsheets for decision support becomes unnecessary. With our full-service subscription model, you receive a steady stream of new functionality and content throughout the year at no additional cost. It also frees IT resources from having to implement and then support another application.